On 11 November, 2015, H.E. 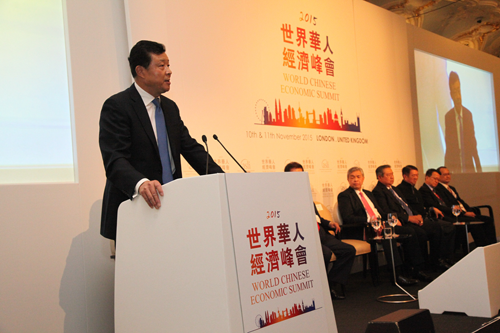 Ambassador Liu Xiaoming attended the opening ceremony of the Seventh World Chinese Economic Summit in London and delivered a keynote speech entitled "Embrace the 'Golden Era' of China-UK Business Cooperation". Ambassador Liu recalled the long history of mutual trade between China and the UK, and listed out the remarkable outcomes of economic and trade cooperation between the two countries in recent years. He hailed President Xi Jinping's historic State Visit to the UK and the beginning of the "Golden Era" of China-UK relations. The State Visit has achieved "super outcomes", according to the Ambassador, the highlight of which being China-UK economic cooperation and trade. The Ambassador went on to talk about China's thirteenth five-year plan for the economic and social development, which is in the process of formulation. The key words of the plan are innovation, coordination, green, openness and sharing. The concept encapsulated in the five key words will not only set the direction for China's own future development but also help to set the stage for China's G20 presidency next year. In a few days President Xi Jinping will be in Turkey for this year's G20 Summit. He will meet with leaders of major economies to determine their collective actions towards inclusive and robust growth. In conclusion, Ambassador Liu urged the business communities from both China and Britain and from all over the world to come together and seize the opportunities in order to begin a golden era of China-UK economic cooperation and write a splendid new chapter of cooperation between China and the rest of the world. In his speech, UK Secretary of State for Business, Innovation and Skills Rt Hon Sajid Javid MP said that the successful state visit to the UK by President Xi Jinping opened up the "Golden Era" of UK-China relations. He believed that with the joint efforts of both sides, mutually beneficial cooperation between the two countries in economy and trade will constantly advance to new levels. Malaysian Deputy Prime Minister Ahmad Zahid Hamidi and Governor of the Australian State of Victoria Linda Dessau also spoke at the Summit. They hailed China's contribution to global economic development and cooperation, and shared their views on further deepening economic cooperation and expanding trade with China. Former Indonesian President Susilo Bambang Yudhoyono, Chairman of the World Chinese Economic Summit and CEO of the Asian Strategy & Leadership Institute Tan Sri Michael Yeoh, Chairman of Asia House Sir John Boyd and nearly 300 people from the business communities of Asia, Europe and other countries and regions were present at the opening ceremony. The World Chinese Economic Summit, established in 2009, is an important platform for Chinese around the world to enhance understanding, exchanges and cooperation. 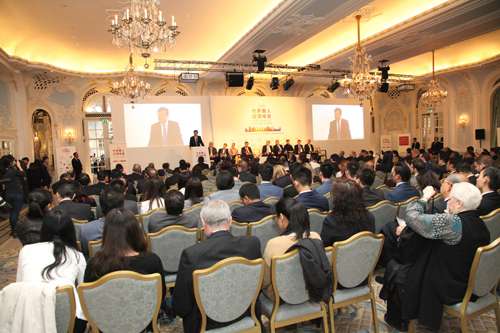 Held from 10 to 11 November 2015 in London, the Summit this year focused on "China and the World: Forging Euro-Asian Partnerships towards Shared Prosperity", and covered the topics of the global influence of the Chinese economy, 'Belt and Road' initiative, and prospects for overseas Chinese business start-ups.